The state police has finally arrested accused Vijay Singh from Mathura. “The accused was arrested from Mathura in a joint operation by Himachal and Delhi Police,” DGP Sita Ram Mardi said in Shimla. To evade detection, Vijay Singh had shaved his moustache and trimmed his hair, the police said and further added that the investigating team traced his location in Mathura on the basis of calls made to an acquaintance. Accused was changing locations frequently and using strangers’ phones for calls. After his arrest, Vijay Singh reportedly told the police that assistant town planner Shail Bala Sharma had refused to back down and even denied accepting bribe, and she led the demolition drive. The state police was subject to fail to provide proper security to a team of Demolition Drive and taking an action the state government has transferred Solan SP Mohit Chawla and Parwanoo DSP Ramesh Sharma to the police headquarters. Now additional SP Shiv Kumar will handle the charge of SP, while DSP Ajay Kumar Rana will be the Parwanoo DSP. The Supreme Court has act tough on the state government and termed the killing of state officer as a result of non-implementation of the law. Terming the murder of Assistant Town Planning officer Shail Bala Sharma as “unfortunate”, a Bench of Justice Madan B Lokur and Justice Deepak Gupta asked the state government to ensure rule of law and implementation of laws on unauthorised constructions. “Unless you (state) take the matter seriously and you believe in the rule of law… you cannot encourage people who break the law. The death is not a result of the court’s order. It is a result of non-implementation of the law,” the Bench commented. “See it’s a huge problem for the future. Now people are (thinking) like let the case come up in Supreme Court then we will see and if someone comes to stop demolition or to implement court order, we will shoot them dead. Where is the rule of law? What is this happening?” the Bench asked. “Unless you take things seriously you are only encouraging people to break the law. These things have to be nipped in the bud. A totally illegal building… You don’t even get to know even after the whole building has been constructed”, it said. The court ordered the state government to file an affidavit detailing the progress in investigation into the murder. The affidavit should also contain details of action taken to demolish illegal constructions and measures to prevent unauthorized constructions in future, the Bench further ordered. The Court also sought to know the progress in identifying illegal constructions in Manali, Dharamsala, and McLeodganj. It asked the state government to file its affidavit by May 9, the next date of hearing. 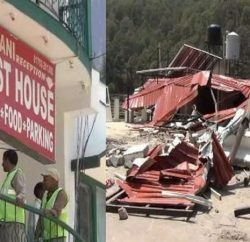 The State Government has decided to confer Himachal Gaurav Purskar to the Assistant Town Planner, Kasauli Shail Bala who laid down her life while performing her duty dedicatedly and committedly in obeying the orders of Hon’ble Supreme Court for demolition of unauthorized construction by Hoteliers at Kasauli in Solan district.